So far, it’s the only SET file to do that. Not sure what happened or why it’s like that. The main challenge with is that while I liked it on the floor against the dark walls, I don’t care for it as a wall texture. I’ll have to go back and tweak/balance it later. In theory, with further modding of the INF files (they determine which art files each level uses), it can be made so that a different file is used but I’m not inclined at this time to do that. Right off the bat, I’ll admit that my “working” copy of TES:Arena has been in use since I first started this project (several years now). It is now a Frankenstein-mess of my experiments. I expanded that executable file with an ancient program, expanded all the resource files, installed “WinArena” over top, fiddled with the INFs, etc. So I don’t know if the weird things I see in the game are my fault or not (easily enough to verify but I don’t really care that much). I even had a very odd problem of an Imperial City textures completely changing from one style to another. I just walked into a mages guild and came out to a completely different looking city. I wished I had made a video of that weirdness. *This post was originally drafted in 2012 but never submitted. I have revised and updated it. The next brief diversion was an even older game called The Elder Scrolls:Arena. It is the first game in one of my favorite video game series and I did play this one a lot when it first came out in ’94. I found a website that packaged it (and it’s sequel) in a neat, easy to install package. But, the low resolution graphics (320 x 200…trust me it’s very low) were so pixelly that it was hard to play and enjoy for me, particularly in the cities where anything in the distance was just a blob of small blocks. After some quick checking, I found that there were NO graphic altering mods out there. No one on the forums seems to think it was even possible. I found that hard to believe and felt the “challenge bug” nibbling at my toes. I wanted to find out how to do it. But I only got as far as checking how the files were stored (container file ending in .bsa). I did find that someone attempted to remake the game (didn’t get finished). It claimed to allow you to extract the art file out of the BSA file for you. BUT in actuality, it converts them to a common image format that the original game can not recognize and thus was not a viable option. Due to real life busyness (yes I mean busy-ness), this too faded to the background. Eventually, I did come back to it later (much like Darkstone) and succeeded in extracting all the files (using a old program). Even though the image files were not in any common standard format, I figured out how to open them in GIMP (free editing software). This involved loading the images as RAW images with a offset header of 12 (think “ignore first 12 bytes of file”) and then loading a special palette files. I could then save it as a RAW image. The drawback to this method was that for images that had the 12 bytes that needed to be ignored (all the IMG files), the saved image wouldn’t have those bytes. That meant that I had to (BRACE YOURSELF) open the file in a hex editor (think super nerdy ), copy all the bytes, then open the original file and paste the copied bytes over starting at byte 13. Then, I tossed that file in main file directory as the game. The only way to see how it worked was to load the game and look for the texture. It was a overly cumbersome process that eroded my enthusiasm and by the time my “interest” (i.e. attention span) waned, I only completed 8 textures. Although I moved on to a different project, I came back once in a while to do a texture or two. I deluded myself in thinking that over time (probably decades), I would eventually finish it. It wasn’t until Hallfiry released his “Arena Modding Suite” that the project took off in a major way. His tool not only unpacked the entire BSA resource file (BSA = Bethesda Softworks Archive) but converted most of the textures into PNG files for easy editing. Afterwards, it could be used to “repack” the BSA easily without destroying the “working folder” and converting the files back to the original format. Besides some textures that used a funky compression, it had removed the technical barriers to changing images in the game. 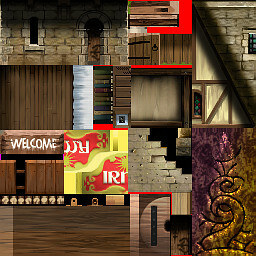 Now to date, I have completed 126 of 172 SET files (wall texture sets) with 12 additional ones that aren’t even used in game. The two biggest challenges for me now are: making unique interesting textures that work well in game (after having already made 126 of them) and figuring out how to do some of the more organic textures to match my style (since the pixel dimensions are very limited). 64 x 64 does limit the amount of creativity I can use. While I haven’t found my most recent version of the Torchlight mod, I did find my proof of concept file for a texture mod of the pc game Darkstone. Although all the Darkstone media assets are stored in “container” files like my other projects, Darkstone art files are a little different when extracted. Unlike Torchlight and Morrowind that have individual files for each image, Darkstone has what I call “image sheets”. I posted about it before but that was quite some time ago. Basically, it means that one “sheet” will be composed of many images fit together like a puzzle and in reality is actually a dozen or so art assets in one “sheet”. Arena and Minecraft “sort of” do something similar. Both of them use a combination. Arena has multiple file types for art assets (some undecipherable) which include IMG files (single image) and SET files (multiple art assets stacked on top of each other in one picture). Minecraft *has/had individual files for items and such and one big image sheet for all environmental “blocks”. The difference in the Darkstone “image sheet” is that all images are not the same size. It takes a little extra experimentation to figure out where some textures start and where some end especially for textures like grass and sand that blend together naturally already as it is. Depending on my needs, I’ll either use the solid blocks of color or shapes (number, letter, etc). As I said, my Darkstone work was merely in the proof-of-concept stage. I had only completed 1/2 of one texture sheet. It was enough to redo some grass and road as well as the trees of only the beginning town (textures aren’t shared across levels). After finding my “sole” texture file, I fiddled with a little and worked on the rest of the grass and road for the level (which included a second image sheet) . However, it is all in the draft stage and needs major cleaning up before I would be happy with them. I have revised the cobble stone to be less “busy”. I tried to use the same style as the other colors (outlines lighter than interior color) but the game keeps altering the colors so I think it can’t handle subtle shades of gray and black. Whenever I get back to this project, I’ll clean up the lines and make sure the grass isn’t so…squiggly. Here is the before and after for the in-game menu. I probably should have shown it more clearly in the last post (and the video). Overall, I’m very pleased with it.